There are 1,737 items available. Please enter a number less than or equal to 1,737. Easy transaction. Arrived at time. Nice item, better than the $40 Verizon charges even has a light. Fast shipping. I have received three of them, one doesn't turbo charge. Like most cigarette lighter plug-in devices, you might need to slip a little card-board shim along side the plastic barrel to get it to stay firmly plugged in, but that is not a defect in this unit's design -- that's just a fact of life when it comes to these kinds of plugs. The unit works properly, switches up to the QC2 charge mode properly, does not get hot, and even has a little light on the end you can turn on so you can see what you are doing in the dark. (Which also makes a cool coil-corded map light when you aren't charging!) I purchased this device for under $5 making it an exceptional value. 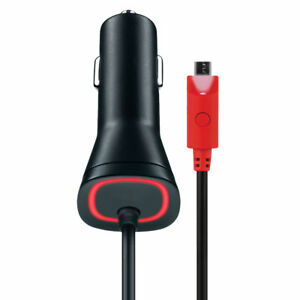 Works great with fast charging and has a built-in flashlight for the dark, great product! Very happy with my purchase. I like the red light so I know it's plugged in correctly. Works great and charges fast!